In a city of good B&Bs, Donnybrook Hall is one of the best. A picturesque building, a home-like feel, and a stellar welcome from Terry and Martina. The house is decorated in a simple way, sympathetic to its Victorian heritage, and rooms follow the same vibe. It's not in the center, but it is in a nice local neighborhood, and it's an easy and quick bus (14 minutes to St Stephen's Green), or a 30-minute stroll into the sights. Perfectly clean and extremely quiet, rooms are cozy if not exactly up-to-the-minute fashionable, with light beige and yellow walls and bright curtains and throws on the beds. Three of the rooms open onto the garden. YOU SHOULD KNOW One room does not have an ensuite bathroom (it has a private bathroom adjacent to the room) - check when you book. Bathrooms are modern and clean, with good water pressure in the showers. It's all about the welcome and the attitude of the staff here, and it's impeccable. It's a cliche, but it does genuinely feel as though nothing is too much trouble, and there's bucketloads of personality and personal touches: one guest reported being bought his own coffee for breakfast the next morning as he only drinks decaf. The B&B serves a great fresh and local breakfast, and will pack up sandwiches for you if you have an early flight. It's served adjacent to the conservatory too, which looks out onto the garden, so it's a pleasantly green start to your day. Guests can get tea, coffee and biscuits all day in the sitting room, where there are papers to read and maps of Dublin. Ask for recommendations: the staff will happily suggest good local hostelries, of which there are a few. The hotel is close to the stop for buses both to the airport (around 50 minutes) and the city center (from 14 minutes). There's fantastic high-end dining available basically on your doorstep - Mulberry Garden (3-minute walk) offers seasonal Irish cooking, or try celeb chef outpost, Marco Pierre White Courtyard Bar and Grill (1-minute walk). Arthur Mayne's (5-minute walk) is an attractive, unusually decorated local pub with its own beers and a reasonable food menu, too. Or Ashton's Gastropub (10-minute walk) is a lovely suburban pub with good food. 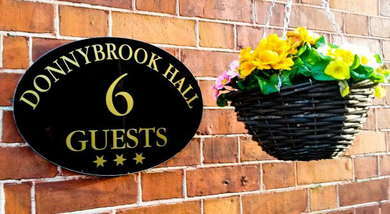 If you like B&Bs and all that means - a friendly, personal welcome, home-y decor, a comfortable room and a great breakfast - you'll love Donnybrook Hall. It's in a quieter part of town, too, which can appeal after a hectic day of sightseeing.